Modiano plastic signs marked playing cards are thicker and heavier than any other plastic cards, once you have used Modiano marked playing cards, you will realize that its texture is can not be exceeded by other plastic cards, you will be fascinated by its texture. 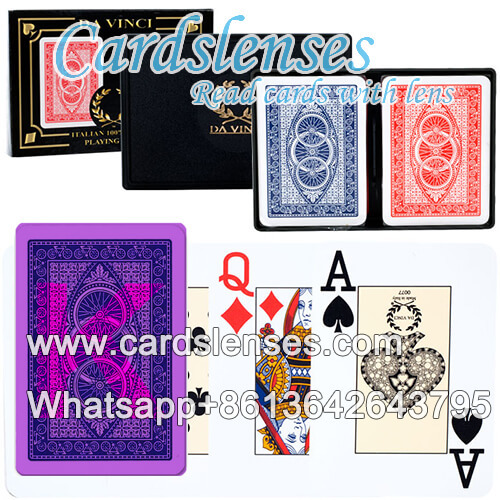 Its thickness also enable plastic Modiano Da Vinci marked playing cards to maintain its shape and character better than other plastic cards. So Modiano Da Vinci plastic marked cards can be used for longer time than other plastic playing cards. Modiano plastic signs marked cards with multiple popular color, which can meet a variety of players of color requirements. Modiano signs playing cards with its variety of colors and texture design impress many players. Modiano marked cards is a matte plastic cards, it does not like other smooth plastic playing cards. Modiano matte plastic marked cards can be easily shuffled and handled.